New customers, please complete our New Customer Registration Form so we can get your information on file. If you have feedback for Townsend Leather regarding anything, please don’t hesitate to contact us at info@townsendleather.com Maybe you have a concern with a recent order, or you want to show us how incredible your latest design turned out, whatever it is, we love hearing from our customers and fans and welcome you to contact us. You can also complete our quick and easy Customer Satisfaction Survey at any time by clicking this link, CUSTOMER SATISFACTION SURVEY. Do you have a charity you want Townsend to know about? Do you have an event coming up that you would like Townsend’s support with? Do you need a donation for a cause you are working on? Townsend Leather is passionate about supporting our community and getting involved and giving back. We might be able to help support your cause. Let us know what your cause is and how we can help by filling out a Townsend “Hugs” Application. Our “HUGS” Team (Help Us Give Service) review all the community outreach/charity/event/donation/HUGS applications that come in and will respond to you with any ways that Townsend is able to support. 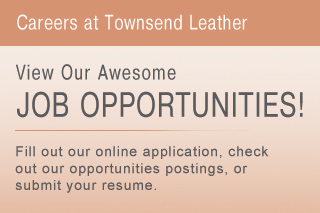 Go to WWW.TOWNSENDLEATHER.COM/HUG to submit your application.